Campeggio Spartacus si trova a Pompei, Napoli. Questo campeggio dispone di piazzole delimitate, sia ombreggiate che, senza ombra e piazzole poco ombreggiate. È possibile affittare roulotte e bungalow. Ogni anno un ispettore visita il Campeggio Spartacus, controllando oltre 200 tra attrezzature e altri punti di interesse del campeggio. L'ispettore è un dipendente ACSI e non lavora per il campeggio. Nice site directly over the road from Pompeii entrance.Old but clean showers. Hot water runs low after morning rush but nice at other times. Friendly staff. Nice Pizza from onsite restaurant. Lots of other restaurants nearby. Appears to be one of the best in the area. Some car parking on site but they are moved round when needed for access. Extended our stay as a good base for visiting area. Train station close to site with trains for Naples, Herculaneum and Sorrento. Would be happy to stay here again if in area. Excellent site for the ruins, but not one you would want to stay long which is a shame as a good location for getting trains to Naples and Sorrento. Never found the pool?? And the showers were a joke. Staff nice. Pitches on top of each other, very tired and needs some TLC. Very busy out and about, watch the traffic. The showers were interesting long time since I have had a cold shower, well shower is a joke it was more of a trickle. Great for visiting surrounding area but not for long stay. Needs someone to sort the place out as could be lovely,just a case of pile them in and take the money. By the way no swimming pool. Arrived on this site in May 2016 to the smallest pitch we'd ever seen! The site is also used as a public car park during the day so always very busy and noisy. The toilets and showers were very poor with many many ants running around. We definitely wouldn't stay here again but would opt for a site outside Pompei as the others sites which were also close to the ruins seemed the same! A tired camp but perfect for visiting Pompeii. Free Wifi, shade and all the basics. Toilet and shower block old but functional. The pool is a para pool out of the ground and looked to green for us to chance swimming in. Very well situated close to ruins, 20 mins walk into Pompei new town. Carrefour supermarket at 10 mins walk direction town centre, good value fuel nearby. Showers fine once system fixed, but were invited to use bungalows up to that time. Basic facilities, staff friendly, expensive WiFi. Restaurant closed, no bread available either. But facilities few yards away. Plenty of shade. Not very good with dogs as nowhere green to go, as to be expected, very noisy as on busy road. Would stay there again if we wanted to return to see the ruins. Folder with basic information only including train times. 24 hour security but so many people coming and going that the constantly changing staff would have been unable to say who is who. Made a reservation 3 months ahead, they got the date wrong and gave away or pitch. Stayed in a drive to one of the bungalows that they rent out by the night to some rather shady looking people. Noisy, busy and full of ants. Toilet block very average. Small pitches and very very tight . Excellent position with helpful staff & Pompeii ruins just across the road. We have an 8 meter motorhome & had no problem accessing a pitch, but the staff do fit 2 units to 1 pitch but this didn't outweigh the convenience of the location for our short stay. Great campsite, very close to the archaeological ruins of Pompei; literally a 2 minute walk from the entrance. Some of the staff don't speak good English; the first member of staff we spoke to didn't accept the ACSI card, but that was rectified the following day. Excellent position, right opposite the Pompei archaeological site and very near A3 motorway. Pitches are small, tucked under orange trees. Bargain price with off-season card. Free wifi worked well. Toilet/shower block needs serious renovation. Hot water in mornings only. But glad they were open when so many sites are closed. Volete prenotare il Campeggio Spartacus o oppure saperne di più? Potete farlo usando i seguenti dati. A3 Napoli-Salerno, uscita Pompei Ovest, quindi a sinistra. Il camping è sulla destra dopo 250m. 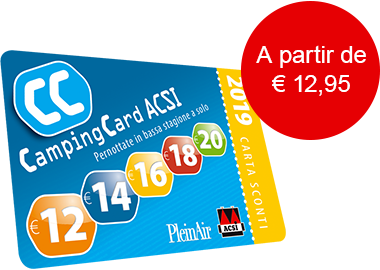 ACSI Eurocampings invia la tua richiesta di informazioni al "Campeggio Spartacus". Camping Spartacus è in posizione ideale per una visita a Pompei e alle bellezze della regione. Stazione ferroviaria e dei bus a soli 150 metri. Piazzole ombreggiate e delimitate con tutti i servizi. Anni di esperienza vi garantiscono un'accoglienza professionale ma calorosa. A 100 metri dall'ingresso degli scavi di Porta Marina.